We have already discussed how organisms get rid of gaseous wastes generated during photosynthesis or respiration. Other metabolic activities generate nitrogenous materials which need to be removed. The biological process involved in the removal of these harmful metabolic wastes from the body is called excretion. Different organisms use varied strategies to do this. Many unicellular organisms remove these wastes by simple diffusion from the body surface into the surrounding water. As we have seen in other processes, complex multi-cellular organisms use specialised organs to perform the same function. The excretory system of human beings (Fig. 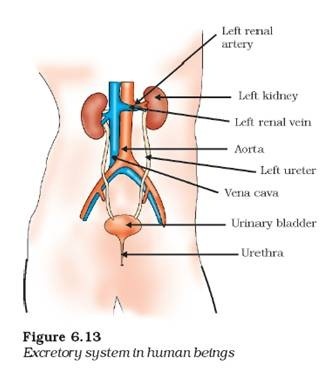 6.13) includes a pair of kidneys, a pair of ureters, a urinary bladder and a urethra. Kidneys are located in the abdomen, one on either side of the backbone. Urine produced in the kidneys passes through the ureters into the urinary bladder where it is stored until it is released through the urethra. How is urine produced? The purpose of making urine is to filter out waste products from the blood. Just as CO2 is removed from the blood in the lungs, nitrogenous waste such as urea or uric acid are removed from blood in the kidneys. It is then no surprise that the basic filtration unit in the kidneys, like in the lungs, is a cluster of very thin-walled blood capillaries. Each capillary cluster in the kidney is associated with the cup-shaped end of a tube that collects the filtered urine (Fig. 6.14). Each kidney has large numbers of these filtration units called nephrons packed close together.